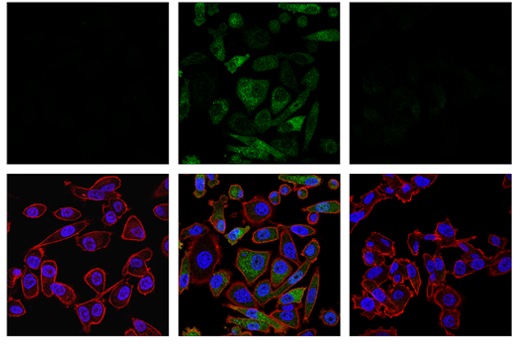 Confocal immunofluorescent analysis of PC-3 cells, untreated (left), treated with CCCP (30 μM, 6 hr; center), or treated with CCCP and post-processed with λ-phosphatase (right), using Phospho-Ubiquitin (Ser65) (E5T1W) Rabbit mAb (green). Actin filaments were labeled with DyLight™ 554 Phalloidin #13054 (red). Blue = Hoechst 33342 #4082 (fluorescent DNA dye). Flow cytometric analysis of PC-3 cells, untreated (blue) or treated with CCCP (30 μM, 6 hr; green), using Phospho-Ubiquitin (Ser65) (E5T1W) Rabbit mAb (solid lines) or concentration-matched Rabbit (DA1E) mAb IgG XP® Isotype Control #3900 (dashed lines). Anti-rabbit IgG (H+L), F(ab')2 Fragment (Alexa Fluor® 488 Conjugate) #4412 was used as a secondary antibody. 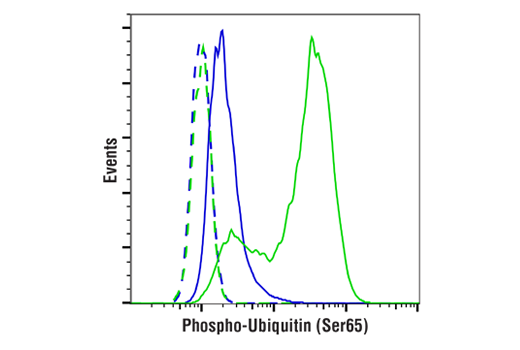 Phospho-Ubiquitin (Ser65) (E5T1W) Rabbit mAb recognizes endogenous levels of Ubiquitin protein only when phosphorylated at Ser65. Monoclonal antibody is produced by immunizing animals with a synthetic phospho-peptide corresponding to residues surrounding Ser65 of human Ubiquitin protein. Ubiquitin is a conserved polypeptide unit that plays an important role in the ubiquitin-proteasome pathway. Ubiquitin can be covalently linked to many cellular proteins by the ubiquitination process, which targets proteins for degradation by the 26S proteasome. Three components are involved in the target protein-ubiquitin conjugation process. Ubiquitin is first activated by forming a thiolester complex with the activation component E1; the activated ubiquitin is subsequently transferred to the ubiquitin-carrier protein E2, then from E2 to ubiquitin ligase E3 for final delivery to the epsilon-NH2 of the target protein lysine residue (1-3). The ubiquitin-proteasome pathway has been implicated in a wide range of normal biological processes and in disease-related abnormalities. Several proteins such as IκB, p53, cdc25A, and Bcl-2 have been shown to be targets for the ubiquitin-proteasome process as part of regulation of cell cycle progression, differentiation, cell stress response, and apoptosis (4-7). Ubiquitin is phosphorylated at Ser65 by PINK1, leading to activation of the E3 ubiquitin ligase Parkin (8, 9). PINK1 accumulates on depolarized mitochondria, resulting in phosphorylation of ubiquitin and activation of Parkin, which then triggers the mitophagy pathway to clear damaged mitochondria. Loss-of-function mutations in PINK1 and Parkin result in early onset Parkinson's disease (10, 11). Ciechanover, A. (1998) EMBO J. 17, 7151-7160. Bernardi, R. et al. (2000) Oncogene 19, 2447-2454. Aberle, H. et al. (1997) EMBO J 16, 3797-804. Salomoni, P. and Pandolfi, P.P. (2002) Nat Cell Biol 4, E152-3. Jesenberger, V. and Jentsch, S. (2002) Nat. Rev. Mol. Cell Biol. 3, 112-121. Kane, L.A. et al. (2014) J Cell Biol 205, 143-53. Koyano, F. et al. (2014) Nature 510, 162-6. Kitada, T. et al. (1998) Nature 392, 605-8. Valente, E.M. et al. (2004) Science 304, 1158-60.